Tough Faith Questions . . . Who Sinned? It happens often enough: You have your lesson guide highlighted, your crafts prepared, and your song CD cued and ready. But somewhere between the singing and the gluing, it happens. A student in your class asks a question. A really tough question. What do you do when these come up? While it’s perfectly honest to say, “Well, let me think about that,” “I’ll read the Bible about it and share next week,” or “I’ll ask pastor,” it can also be helpful to anticipate these questions. After all, certain Bible narratives seem to prompt some of these tough questions, so this blog series will try to think ahead and help you out with some of the questions that may come your way. If you’re following the recommended schedule for Growing in Christ and Cross Explorations, you’ll likely come across the lesson “Jesus Heals a Blind Man” in the near future. 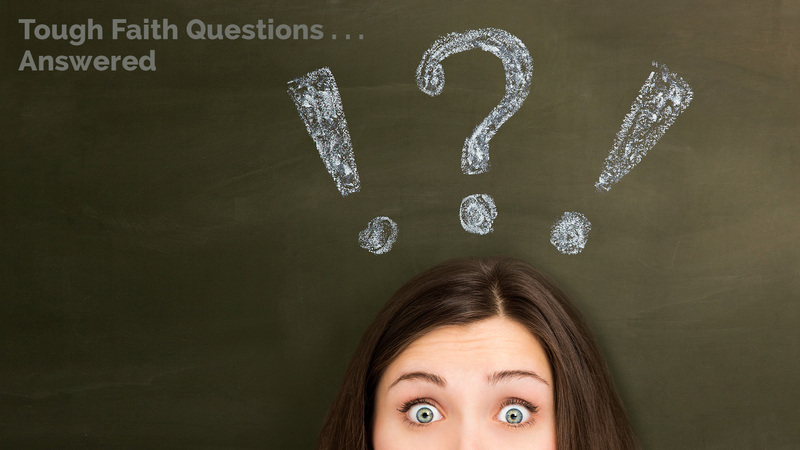 It’s a great account to use for the first post of this “tough questions” series, because in it the disciples ask their Teacher a really tough question. “As He passed by, He saw a man blind from birth. And His disciples asked Him, ‘Rabbi, who sinned, this man or his parents, that he was born blind?’” (John 9:1–2). The disciples see someone in need, and they instantly ask a common question: Whose fault is it? Or said another way, Who should we blame? Another common way to say it is, Why do bad things happen? Right off the bat, these are dangerous questions, and Jesus is quick to point this out. By seeking a cause, they’re essentially looking for the one who should be in trouble. In the end, the person is asking, “Why did God let this happen?” The blame-finder ends up blaming God. But we’re getting deep pretty fast here. Let’s take a few steps back. Our God is a loving God. When we agree on this point, we already remind ourselves and our students that God is never looking for an excuse to strike any of us down with blindness or some other sickness. So why do bad things happen? Let’s go back before any bad things did happen. Our God created a perfect world. Now we’re getting closer. We’re about to lead into the spot where bad things start to happen, and when was that? When Adam and Even sinned, the world was no longer perfect. There we go. If we want to point fingers, we need to point them at ourselves as human beings. Sin came to this world because of us. Bad things happen because this world is fallen due to sin. But, wait, there’s more! Don’t stop there, because we’re really only where the disciples are so far: they agreed that this case of blindness was due to sin, but they went a step too far. They wanted to find THE sin that caused THIS sickness. Did the man’s parents sin, the disciples ask, or did the man sin really, really early to have been born blind? We know that bad things happen because of sin, but we want to steer clear from making any specific “this bad thing happened because of that sin.” That’s speaking for God, which isn’t wise. We don’t always know why bad things happen, but they happen in our imperfect world. Jesus came to our world to save us from sin and every evil. He will come again. He’ll bring us to His side. Someday, we’ll live in a perfect place with Jesus, where nothing bad happens. How do we know? Well, Jesus says so. And in cases like this Bible account, He shows us. “Jesus answered, ‘It was not that this man sinned, or his parents, but that the works of God might be displayed in him. . . . As long as I am in the world, I am the light of the world’” (John 9:3, 5). Jesus says that He will make all things right, and He proves that He can when He displays His Father’s power and glory. He proves it when He heals a man who was born blind. As you give these truths, think about the ages of your students. Younger children will happily listen to these important points. Pick a few key points and encourage them to echo you. For older kids, ask them the questions, such as, “What do we know about God?” Break the class into groups to find Bible passages to support these truths. As you work through this lesson and kids get stuck on the tough questions—or when this question comes up when a pet dies or a grandparent is sick or a knee is scraped, you can review these truths with your students, pointing to what we know in the Bible to help explain the questions that can be tough to answer.